Larry J. Sabato's Crystal Ball » The Electoral College: Democrats’ Friend? The Electoral College: Democrats’ Friend? It’s way too soon to make any firm prediction about the outcome of the 2012 presidential election. We don’t know what President Obama’s approval rating will be in the fall of 2012 or what condition the U.S. economy will be in a year from now. Economic conditions and ratings of the incumbent’s job performance 14 months before Election Day don’t predict what those numbers will look like a year later. And of course we don’t know who the president’s Republican challenger will be, which could make a big difference in the outcome. But while it’s too soon to predict the outcome of next year’s election, there are some things that we can predict about that election with a fairly high degree of confidence based on the results of recent presidential elections and long-term trends in American politics. First, it is very likely that next year’s election will be close, at least in the national popular vote. We haven’t had a true landslide in a presidential election since 1984, and the last three elections have been highly competitive. Even Barack Obama’s seven percentage point margin over John McCain was relatively narrow by historical standards. Only seven of the previous 25 presidential elections were decided by a smaller margin in the popular vote. The reason why the popular vote is likely to be close next year is that identification with the two major parties is very even, and party identification is a very strong predictor of presidential voting. For example, the Gallup Poll showed that during the first six months of 2011 an average of 44.9% of voting age Americans identified with or leaned toward the Democratic Party while an average of 44.8% identified with or leaned toward the Republican Party. Of course the winner of the presidential election is not determined by the popular vote but by the electoral vote, and while the electoral vote tends to closely reflect the popular vote, when the popular vote is very close, a split result is possible, as we saw in 2000. 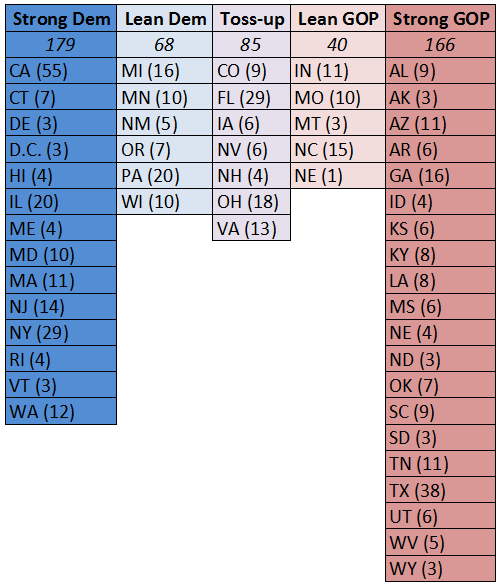 So what can we expect from the Electoral College in 2012? First, even without knowing the winner or the exact margin of the popular vote, we can already predict the outcome of the election with a very high degree of confidence in at least 33 states and the District of Columbia. Together, these jurisdictions will award 345 of the 538 electoral votes. No more than 17 states with 193 electoral votes are likely to be up for grabs in 2012, and the actual number could be a few as seven states with 85 electoral votes. Notes: High = 0-4.99%, Moderate = 5-9.99%, Low = 10-14.99%, Very Low = 15% plus. District of Columbia included in 1976-2008 results. 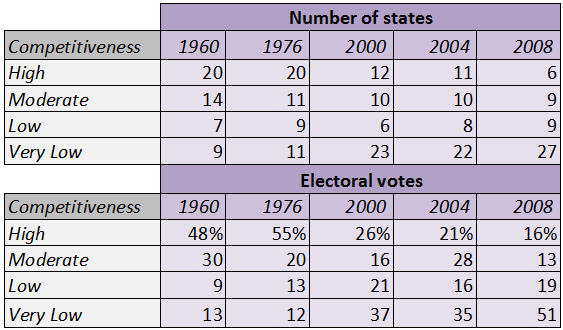 The reason why we can already predict the outcome of the 2012 presidential race in so many states is that over the past 30-40 years, as the data in Chart 1 show, the number of states that strongly favor one party has increased dramatically while the number of evenly balanced states has decreased dramatically. In the color-coded language of modern election analysis, there are far more deep red and deep blue states and far fewer purple states then there were in the past. Moreover, the deep red and deep blue states now include many of the most populous states that award large blocs of electoral votes. In 1976, for example, every one of the eight most populous states, including Texas, New York, Illinois and California, was a battleground. In 2008, however, only two of these mega-states, Florida and Ohio, were decided by less than five points while six were decided by more than 10 points and three by more than 20 points. Based on the results of the last three presidential elections, we can classify all 50 states and the District of Columbia into one of five categories: Strongly Democratic states voted for the Democratic candidate by at least five points in all three elections while strongly Republican states voted for the Republican candidate by at least five points in all three elections. Unless something happens to produce a landslide or near-landslide margin in the national popular vote, a result that seems rather unlikely, all of these 33 states, and of course the District of Columbia, can be expected to end up supporting the same party again in 2012. That would give President Obama 179 electoral votes and his Republican challenger 166 electoral votes. Another 10 states (along with one congressional district in Nebraska, which is one of only two states that allows its electoral votes to be split) appear to lean toward one party or the other. Some of them, like Michigan and Pennsylvania, have supported the same party in all three elections but sometimes by only a narrow margin. Others, like Indiana and North Carolina, have supported candidates from both parties but have given much bigger margins to one party than the other — in this case the Republican Party. If the national popular vote is close, within two or three points one way or the other, these states will most likely support the party they lean toward. Combined with the electoral votes of the strongly Democratic and strongly Republican states, that would give President Obama 247 electoral votes and his Republican challenger 206 electoral votes. If the national popular vote is very close in 2012, the outcome in the Electoral College will probably come down to seven toss-up states with a total of 85 electoral votes: Colorado, Florida, Iowa, Nevada, New Hampshire, Ohio and Virginia. President Obama would need to pick up at least 23 electoral votes from these states while his Republican challenger would need to pick up at least 64. This means that President Obama could win the election by carrying just Florida or by carrying Ohio and Virginia or by carrying Ohio plus one smaller state (but not New Hampshire) or by carrying Virginia plus two smaller states. The Republican candidate would need to carry Florida, Ohio and Virginia plus one smaller state to get to 64 electoral votes. So a slight advantage to Obama. It appears that there are more ways that he can piece together the 270 electoral votes needed to win in a close election. Despite what happened in 2000, the Electoral College may yet turn out to be the Democrats’ friend in 2012.